For The First Time, Rocket Fired From Gaza Hits Jerusalem : The Two-Way The Palestinians have been firing rockets at Israel for years, but the volleys had been confined to the sparsely populated south of the country. The attack directed at Jerusalem is seen as a powerful symbolic blow. 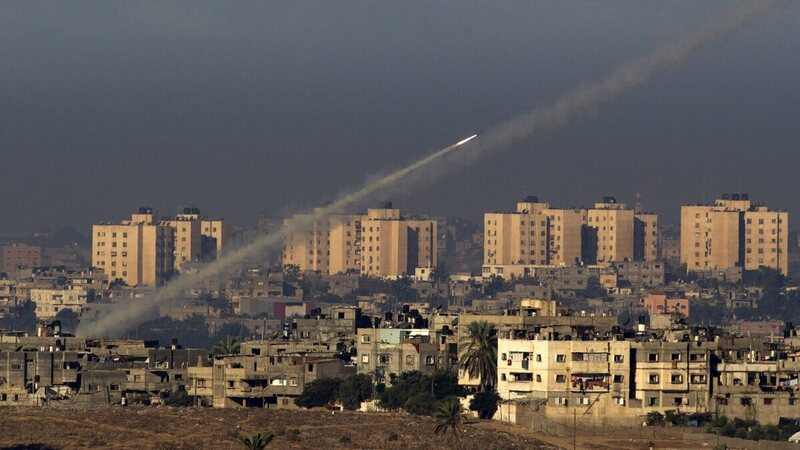 Palestinian militants fire a rocket from the northern Gaza Strip toward southern Israel on Thursday. For the past decade, Palestinians in Gaza have been shooting short-range rockets into southern Israel. But Palestinians fired a much longer range rocket that landed just outside Jerusalem on Friday, a move seen as a major escalation. Palestinian militants in the Gaza Strip have fired thousands of rockets into southern Israel over the past decade. Yet the one that landed harmlessly in an empty field south of Jerusalem on Friday could be as significant as all of the rockets that came before. With that lone launch, the Palestinians demonstrated for the first time that they now have the capability to send a weapon the roughly 50 miles from the Gaza border north to Jerusalem. The Palestinians also delivered a powerful symbolic and psychological message by targeting the most fiercely contested city in the Israeli-Palestinian conflict, a place that both sides claim as a capital. "We are sending a short and simple message: There is no security for any Zionist on any single inch of Palestine and we plan more surprises," Abu Obeida, a spokesman for the Hamas militant wing, told The Associated Press in claiming responsibility. Israel did not immediately say how it might respond. But for years, security officials have warned that rocket attacks on Jerusalem and Tel Aviv, the country's largest and most important cities, would mark a major escalation in the conflict. NPR reporter Sheera Frenkel, citing Israeli military officials, says the rocket fired at Jerusalem, and two fired at Tel Aviv on Thursday, were made in Iran. Neither city had come under rocket fire since the 1991 Gulf War, when Iraqi President Saddam Hussein targeted Tel Aviv with dozens of long-range rockets, causing damage, but inflicting few casualties. Even then, the Iraqi leader did not aim at Jerusalem, presumably because about one-third of the city is Palestinian and it includes important Muslim holy sites. The Palestinain rocket campaign against Israel came as part of a broader uprising launched in 2000. Since then, the Palestinians have fired more than 10,000 rockets out of the Gaza Strip, but their range had been confined to southern Israel, with only a few scattered cities. Israel's anti-rocket system, known as Iron Dome, is shown in action on Thursday, Nov. 15, near Beer Sheva, in southern Israel. The system is designed to shoot down incoming rockets launched by Palestinians in the nearby Gaza Strip. Palestinian militants in the West Bank have not fired rockets at Israel, even though Jerusalem and Tel Aviv are close by and well within range. There's been a widespread belief that the Palestinians were wary of provoking a major Israeli response. But Hamas, the radical Islamic group that controls Gaza, showed that it was willing to take that risk. The original Palestinian rockets were fashioned in Gaza metal workshops where cars are repaired. They were so crude the the launching tubes were often made from tall lampposts that had been taken down and chopped up into sections. 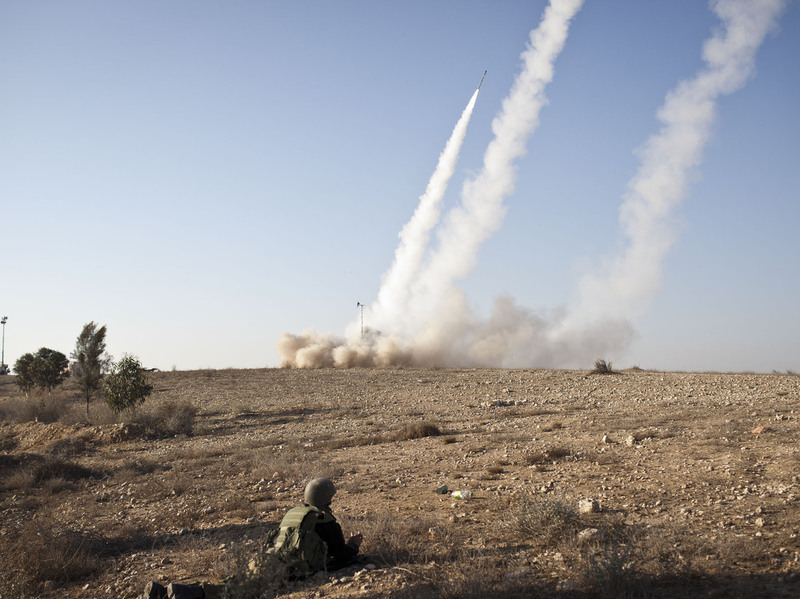 The rockets were wildly inaccurate, traveling only three to five miles and often failing to make it beyond the boundary of Gaza. They were as dangerous to the Palestinians living on the Gaza side of the border as the Israeli targets on the far side. With no guidance system, they occasionally missed landfall altogether, splashing down in the Mediterranean Sea. So why did it take the Palestinians so long to get the longer range rockets? The Israeli military presence in the Gaza Strip from 1967 to 2005 made it difficult for the Palestinians to smuggle in large weapons. But when the Israelis withdrew seven years ago, smuggling along Gaza's southern border with Egypt increased. The Palestinians have been importing commercially made weapons from abroad, including Iran, according to the Israeli military. In recent years, the Palestinians rockets have occasionally been reaching cities along Israel's coast, like Ashdod and Ashkelon. The Israelis responded with a rocket shield, called Iron Dome, which has deflected some, but not all incoming rockets in recent years. For Hamas, another boost has been the rise of Egypt's Muslim Brotherhood, which now runs Egypt. The former Egyptian leader, Hosni Mubarak, was extremely wary of Islamist groups like the Brotherhood and Hamas. But in a demonstration of the new relationship, Egypt's Prime Minister Hisham Kandil visited Gaza to show solidarity with the Palestinians.